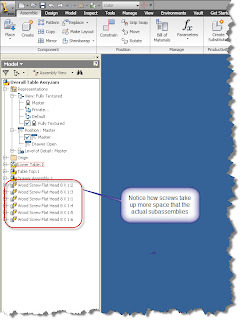 One of the new features in Inventor R2010 that seems to be getting 'lost in the noise' are the new Assembly Folders. There are plenty of good features that have come in the new version, and while they deserve their accolades, I don't think Assembly Folders are getting their due. So, what exactly is an Assembly Folder? In short, an Assembly Folder is just a folder that's created in the assembly browser. 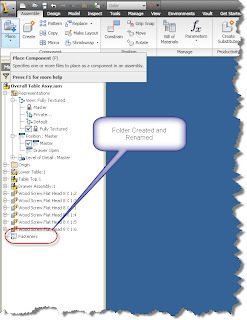 You can place components in this folder and gather up similar components in that folder. It reduces the components sitting at the top level of your assembly level browser, and makes for a cleaner and easier to navigate interface. Here's an example where I'm starting to use them. I've a woodshop project that I built a few years ago (a Craftsman style table). If you look at the screen capture, you can see that I have several screws that take up more real estate in my browser than the subassemblies that make up the table. I'm going to place the screws in a folder called 'Hardware' and collect them in that folder. The first step is to right click in the assembly browser. You'll see an option to 'Create New Folder'. 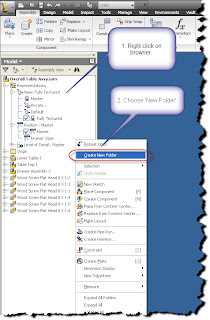 Choose 'Create New Folder' and a folder will appear in the browser, and its name will activate, allowing you to rename in. In this case, I've called it 'Fasteners', although you could name it anything. Now you can just drag and drop the components you want (in my case the fasteners) into the folder. Once this is done, you can see how this cleans up the browser. 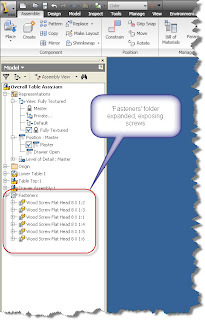 If you need to access the parts, you can still expand the folder, and expose the components inside the assembly folder. Once you see them, you can access them just like you did before!